"Banana retail prices are too low"
Walk into the fresh produce section of your local supermarket and chances are, the cheapest item will be bananas. Bananas are grown year-round and travel across the ocean from the tropics and can be found in almost any food store around the world. Does the retail price for bananas truly reflect the cost of growing them? Should consumers pay more for bananas to provide better returns for growers? Equal Exchange, a US-based importer and trader of bananas and other tropical products, says that banana prices are too low and need to increase in order to properly reimburse growers. "Retailers often price bananas as low as possible, even at a margin loss, to draw customers into stores and remain competitive," said Angelica Hicks of Equal Exchange. "As the U.S. grocery industry consolidates, multinational retailers now exert unparalleled price pressure in the marketplace, compelling even independent stores to match unsustainably low banana prices. That price suppression ricochets through the supply chain and ultimately results in the exploitation of labor and the environment at source." Equal Exchange focuses on "fairly-traded" goods, which on a larger scale, aims to change what they see as inequitable trade dynamics. They do this through partnerships with small farmer cooperatives. "For bananas, the model entails purchasing fair trade, organic fruit from farmer co-ops at sustainable prices and stable volumes," Hicks explained. "The result is a responsibly-grown, traceable, and high-quality banana - at a slightly higher price." 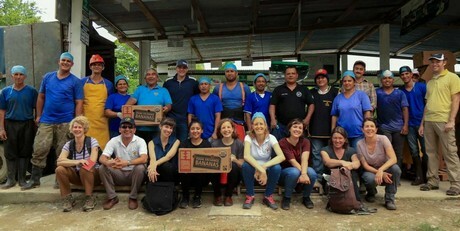 As an importer, Equal Exchange purchases bananas from independent coops in Latin America and sells them to the US market. The company says one of the keys is to connect the farmer with the consumer and results suggest that this is gaining popularity among consumers thanks to the work of the coops themselves. 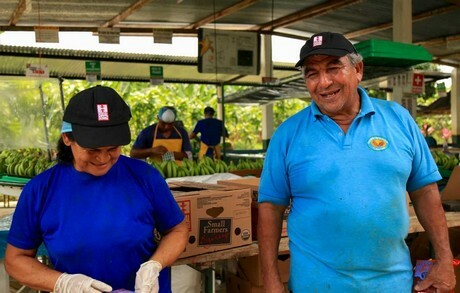 "Over 12 years, Equal Exchange has built up consumer awareness and marketability of small-farmer-grown bananas, thereby connecting long-term producer partners in Ecuador and Peru to the buying power of the U.S. market," Hicks said. "We are now purchasing more bananas from small producers than ever before: in 2018 alone, Equal Exchange paid over $4 million directly to small producer cooperatives for bananas alone." "Our co-op partners – AsoGuabo in Ecuador, CEPIBO and APOQ in Peru - invest in community-led development projects, stimulate rural economies, engage in continued education, and carry out sustainable agricultural research," she continued. "Equal Exchange doesn’t take credit for or intervene in these effective projects, but Equal Exchange helps engender them through consistent banana purchases." The company also shared one of the projects that the Ecuadorian coop AsoGuabo has been able to accomplish. 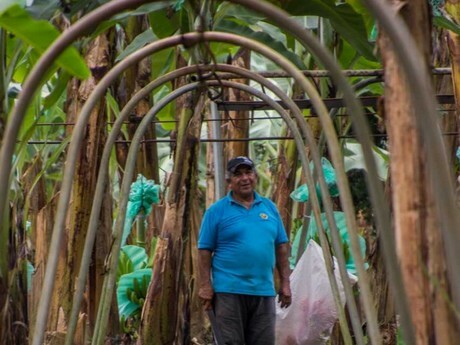 "Equal Exchange’s longest-running banana partnership is with the Asociación de Pequeños Productores el Guabo (AsoGuabo), a cooperative of 130 land-owning small farmers along the Southern Coast of Ecuador. Recently, AsoGuabo broke ground on a biofábrica, a facility to produce organic inputs onsite to improve soil health and productivity of its producer members. What’s particularly remarkable about these projects is that they are selected democratically by small-farmer co-op members themselves." According to the company, volume sold in the US from 2016 to 2018 grew by 52 percent. "This growth is thanks to the dedication and hard work of long-term distributor and store partners who have spent years stocking, selling, promoting, and discussing Equal Exchange bananas, even when there are cheaper options. The program is resonating with those who increasingly care about how food is produced and sold," Hicks said. Much of Equal Exchange's market has been focused on the upper Midwest and the Northeast. In 2018, the company directed greater attention to the West Coast, where they teamed up with a wholesaler distributor in San Francisco. "In late 2018, we started a weekly banana program on the West Coast with Earl’s Organic Produce," Hicks shared. "It’s an exciting moment for Equal Exchange and producer partners, and an opportunity to spark a conversation about the banana trade with communities in California." She added that this conversation will continue this year when the company will launch a major campaign in March, the aim of which is to heighten awareness and educate more consumers about their approach. "2019 is poised to be a year of growth in both volume and sales, so it’s important to prioritize education campaigns and facilitate shared learning across the supply chain. Our next major campaign will launch in March 2019, Equal Exchange Banana Month, and will entail interactive opportunities to explore the alternative nature of our program and its results." In the end, the goal is the same - to show retailers and consumers that paying a little extra for bananas may create better circumstances for the people that grow them. "This is a critical moment for the grocery industry to resist pricing and marketing practices that perpetuate exploitative trade relationships," Hicks concluded. "Equal Exchange remains committed to creating a space for fairly-traded, cooperatively-grown small farmer bananas in the market; to nurturing balanced and cooperative trade relationships; and to offering meaningful information - and an honest choice - to consumers."